Cheer on the Spring Lake Lakers as they take on the Fruitport Trojans! Cheer on the Spring Lake Lakers as they take on the Fruitport Trojans! 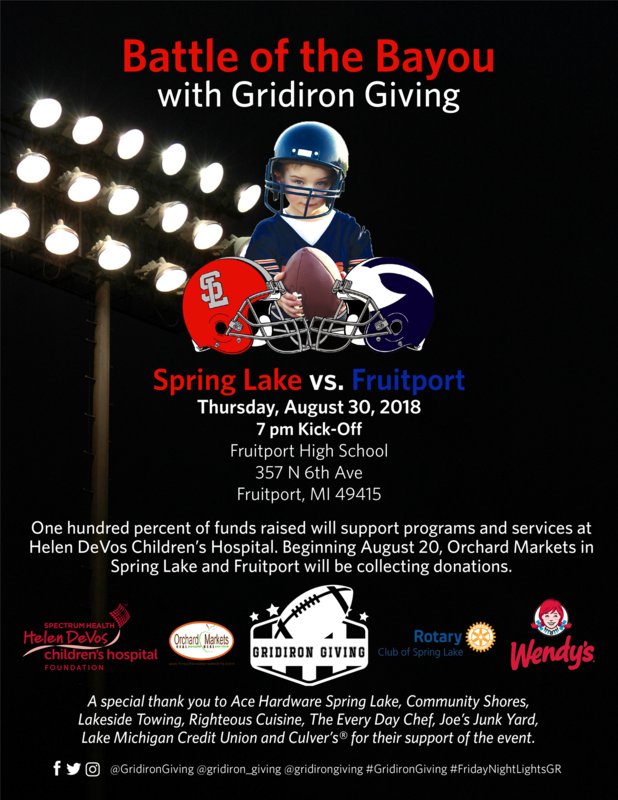 This is a special Gridiron Giving game night; donations will be collected at the ticket booth/gate to support Helen DeVos Children's Hospital and the Spring Lake Rotary Club is a proud partner of this event! Beginning August 20, The Orchard Markets at Spring Lake and Fruitport will be taking donations. give.helendevoschildrens.org/gridirongiving or visit give.spectrumhealth.org to learn how your giving matters.